The tools you decided to use to do your makeup with is just as important as the products you're using; they really can make a world of difference. I have a mixture of Real Technique and high-end brushes in my collection but have recently been introduced to So Eco's brushes after they sent me a couple of their brushes from their new Rose Gold Collection. So Eco is a range of eco-friendly makeup brushes, with the components all being 100% responsibly and ethically sourced. Although they are eco-friendly they don't compromise on the quality of the product. 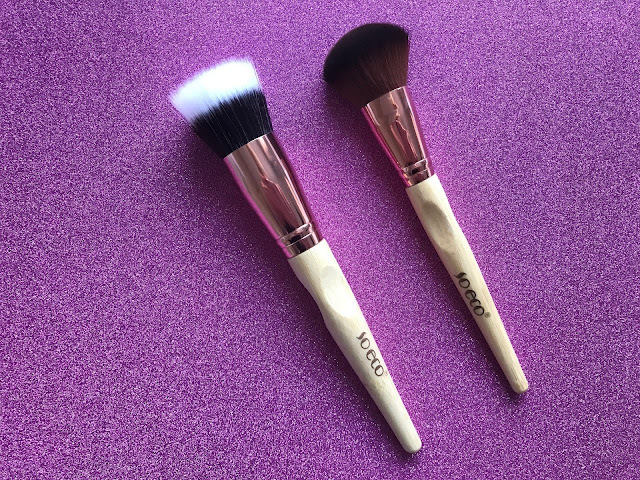 The brushes are made from bamboo for the handles and cruelty-free sourced bristles which are perfect for using with liquid and powder products. What I love about these brushes is that the design is so simple but looks beautiful with your makeup collection, and more importantly, they are a pleasure to use. I was sent the Stippling Brush and Multi-Tasking Brush to try out a few weeks ago now, and every day without fail I still reach for them. The handles are designed to be slightly weighted with a section to grip, making them really comfortable to use. Then obviously as it's from their Rose Gold collection there is a beautiful rose gold band in between the handle and the bristles which make them look more high end. The bristles are very soft and fluffy and so far I haven't experienced any stray hairs! I have used the stippling brush with different foundations and I found they all blended very well without leaving streaks. I tend to use it in a buffing motion for a light coverage and then stipple extra product over areas I wanted more coverage. I have been loving using the Multi-Tasking brush for my highlighter; as the brush is rather dense I find that it really packs the product on and gives me an insane glow. I hadn't tried So Eco products before but I'm so glad I have come across them as they're now a staple in my everyday makeup routine. You can buy them in Sainsbury and Tesco stores as well as online on Amazon. Have you tried So Eco brushes before? What's your favourite makeup brushes to use? * These products were kindly gifted to me by So Eco but all opinions are my own.